When it comes to video selling, show, don't tell. If it takes you more than two sentences to explain a feature of your product, you may be writing too much. And reading is homework… Why would you make your prospect do the homework they skipped in high school to buy your product now? (Just kidding Mr. Glatt - you know I always did all of my reading 🙃). Rather, treat your buyer to a fun video, where they can see your product themselves, and hear from your mouth exactly how your product can change their life. Video is “eating the world.” Nearly 80% of all web traffic is video, and 72% of B2B buyers are watching videos throughout their buyer’s journey (Salesforce), with 59% of senior executives reporting they would rather watch a video than read text (Forbes). Micro demo videos are awesome ways slip in informative, engaging content. A micro demo is a 1-3 minute highly focused demo of your product. You are not trying to convey everything your product is capable of, but rather, very specific features as they apply to your customers. Show, don’t tell. Don’t just pitch your product, inspire your potential customer by showing them what could be theirs. Control the story. It is crucially important to convey the right message to every decision maker involved in moving the deal forward. These videos maintain the integrity of your words as they are shared with other decision makers across the org - no more game of telephone. Fit to your buyer’s schedule. No need to adjust for various time zones and busy schedules, let your buyers watch the video at their convenience. Perhaps you just had a call with a potential buyer who mentioned that a certain feature would be integral to moving the deal forward. Make her a personal micro-demo to show exactly how the feature looks in action. “Would you like to schedule time for a more comprehensive demo? Perhaps you just had a great call with a prospect. They told you a bit about the problem they are trying to solve, and they believe your product will be a good fit. Now it’s time to loop in the rest of the team. Make a short video to catch the other team members up to speed. Give them a quick overview of what your product does, and how it will solve the problems that you discussed with the initial contact. Micro demo videos should be highly personalized to each use case. As a demo video, it is easy to think about this video as being all about your product. But everything you show should be directly tied to an immediate customer need. 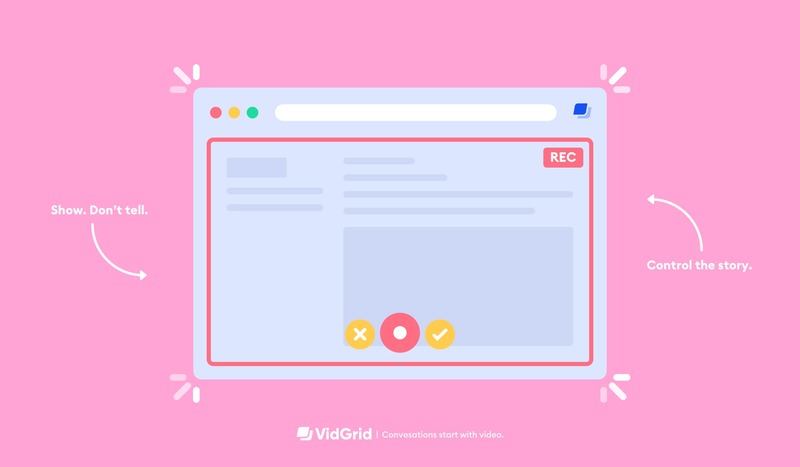 If the user in already in a trial, Use VidGrid + Fullstory to record where users are getting stuck in the trial and give them some pointers. Use video data and analytics to track who is watching the video. Is the video being shared across the org? Are decision makers watching?